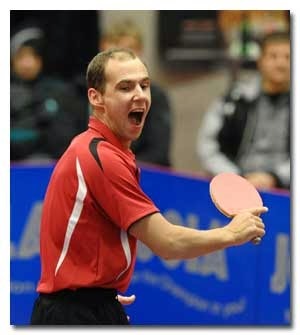 Thomas is an energetic and successful table tennis player who has had a lot of success in Eastern Europe and the United States over the years, including having 2 victories at the US Table Tennis Open and frequently appearing in the Challenger Series where he has had great success. On his site he confesses to being one of the craziest players in the top 100 World Rankings, a real character and great to watch! Thank you Thomas for the interview. The Brazil Open. I was 3rd place. I beat 3 Top 20 WR Players. And the US Open. I won that two times. I want to play the Olympics next year. Nobody. Maybe Japan. Many young player come up. Who is you favourite international player? What do you think is the hardest thing about playing table tennis internationally? Service and return and counter loop. You must pratice these 3 things very much. In very very important tournament I try to win 11-0. Everything is possible that you can lose. Do you feel the Challenger Series is good for developing your game and do you enjoy the competition? Yes I enjoy this tournament and I can try more things that I learn in pratice. If you were stuck on a desert island, which table tennis player would you have with you there?